Shay’s in Monument Square is one of those places I pass by regularly, but never think to actually go into. That is until my wife mentioned that she used to go there all the time and wanted to go back. I was up for the challenge since I’d never been in and always want to try a new place. When we got there, they had both indoor and outdoor seating available, but the wind made us want to stay within the confines of the interior walls. We walked in and were seated by the window looking outside to the monument. We were at Shay’s for an early dinner. The place wasn’t overly full but the bar almost was. There was a drink menu on the table and we received food menus from the waiter. I was excited to see what they had to offer my hungry belly and perused both menus with the eye of the tiger. I noticed a $5 martini section on the drink menu and decided that the time was now to order $5 martinis. I had to choose which one I wanted though as so many of them looked enticing. As my queen bee noticed a sangria drink special, I laid my eyes upon my first drink selection of the night – the Pineapple Martini – homemade pineapple infused vodka, splash of pineapple juice. That sounded like a champion. We placed our drink orders and got down to decision making on the food. The menu was primarily Shay’s take on pub grub – apps, burgers, and the like. I was looking for some nachos and found them. I wanted pulled pork on them, but I was coerced by milady to get them with chicken. I liked that they were pretty well loaded with tomatoes, black beans, black olives, jalapenos, salsa, sour cream, and cheddar jack cheese. Our drinks came out and I was well-prepared to try my lovely libation. I took a sip of the juice. Holy passionate pineapple perfection! I don’t know if I’d ever had such a simple, perfectly-mixed drink. The vodka to pineapple ratio was probably the best I’d ever tasted and I have extensive experience in vodka pineapple world. As it was going down way too fast, my wife enjoyed her sangria, but I couldn’t get my lips off the martini glass long enough to pay any attention to her. In the middle of my martini drinking excursion, we received our nachos. They were glowing with cheesy cheer and piled high. I started to eat them. I loved that there were lots of them and there was no shortage of the toppings. Like the martini, I shoved the nachos into my face, hardly taking time to inhale air as that would have seriously diluted the nacho injection I was giving my mouth. I ate and ate and eventually realized that there was actually too much topping for the chips. I rejoiced. I want my nachos to have an excess of topping. It’s the way they were intended. After I scraped every, last nacho morsel and crusty cheese chunk off the plate, I was ready to order another drink. I went with another $5 martini – the Tequilatini with tequila, raspberry liquor, sour mix, and fresh lime juice. That sounded prize-worthy. We also had to come up with the rest of our order. 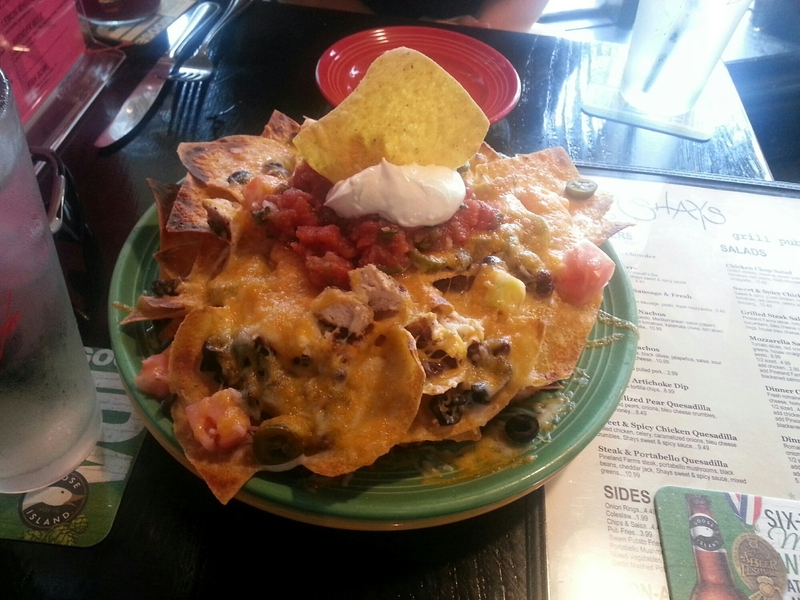 The nachos were pretty big, but we were both hungry, so there was more food in our future. After a final look at the menu, I chose a Sriracha Chicken Sandwich – grilled chicken breast, cheddar cheese, sauteed red onions, roasted red peppers, Sriracha mayo – and my lovely wife went old school with the Tuna Melt Panini – solid white tuna, American cheese, house made pickle, marble rye. We were ready to take down some sandwiches. I substituted onion rings for the standard fry side and my wife went with sweet potato fries. My Taquilatini came out and I tried a sip. It was strong and tasty overall, but a little sweet for my tastes due to the raspberry liquor. It wouldn’t stop me from consuming it that night, but I would go with something a little less sugary next time. We patiently waited for a sweet sandwich serenade and discussed all manner of happenings including excessive picture taking of the monument outside and the multi-layered story arc of our favorite Dr. Seuss books. Before long, we got our grub and were determined to dig in. I threw my lettuce, tomato, and top of the bun on the rest of my sandwich and went to town. As I lifted the sandwich to my mouth, a bunch of peppers and onions fell out. It was going to be messy, I thought. I carefully took a couple big bites and analyzed the situation. The chicken and cheese were a good sandwich base. The peppers and onions were a nice touch. However, there was one issue with the sandwich that I felt was a bit of a misstep – the sriracha mayo wasn’t heavy enough on the sriracha. It didn’t make for a bad sandwich, but it was more of a chicken sandwich than a sriracha chicken sandwich. Despite a light offering of sriracha on my sandwich, I happily ate it, When I was finished, my wife was only half done her tuna melt and offered me the rest. I accepted a piece for research purposes even though I was quite full. It was really good – mixed with a solid amount of mayo, great pickles, and excellent bread. It was worth the taste. I wish I could have eaten all of it, but my stomach wouldn’t allow for any more. It was time to wrap up. When the bill came among, our total with tax and tip was a little over 50 bucks. That was nothing to sneeze at for a good amount of food and three delicious drinks. Despite the minor issue with my chicken sandwich, the food was really good. Shay’s is a really solid bar with very good food. Their nachos were excellent, their sandwiches were done right, and their drinks…well…have that pineapple martini and rave about it yourself. Shay’s has fun atmosphere too. Go there when your feeling grill-pubby and you’ll love it. This entry was posted in Portland, ME food on June 6, 2015 by peterpeterportlandeater.